This is the most comprehensive review of maritime cabotage law. It introduces the new theory of Developmental Sovereignty to jurisprudence. The maritime cabotage law provisions and approaches as adopted in many states and jurisdictions has been extensively scrutinised. 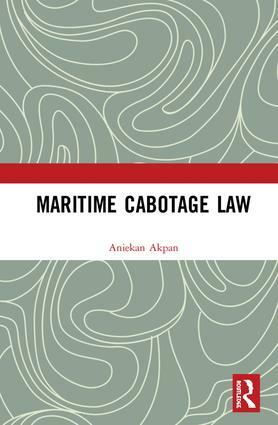 This book challenges the established and accepted wisdom surrounding maritime cabotage by presenting new reasoning on the underpinning principles of the concept of maritime cabotage law. The book offers a vibrant discussion on the adjustment in the regulatory approaches of maritime cabotage, from one that was intrinsically premised on the idea of national sovereignty, to one that now embraces the broader ideology of development. It investigates what the common understanding of the law of maritime cabotage should be and on what intellectual basis it can be justified. It reduces the inconsistencies and confusion that surround the concept and application of maritime cabotage law, to provide a more certain and more robust concept of maritime cabotage. 9.1.4 Shipbuilders Council of America, et al. v United States of America, et al. Dr Aniekan Akpan is a lecturer in law at City, University of London. He is also a specialist maritime law consultant in the city of London and overseas.